The router we have selected for our Trooli Home broadband services is the Technicolor DGA2231. Power inlet – This is where you connect the power supply and is located at the back of the router. You should only use the power cable that is delivered with your router. Power button – This allows you to power on/off your router. The power button is a black button next to the power inlet on the back of the router. What are the different ports on the router for? Wireless Access Point – The router has a built-in Wi-Fi access point. This allows you to connect your devices wirelessly to your home broadband connection. USB Port – You can connect a USB storage device into this port. Ethernet Ports – You can connect an Ethernet device (for example, a PC or Mac computer) to Trooli network. When a device is connected a green LED light will appear on the router. VoIP Micro Filters – You will hear more about these soon. Please keep these in your router box until we are ready to launch this feature. 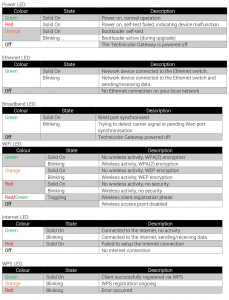 Wi-Fi button – disable your wireless access point. You can do this when you do not have any devices that are connected to the wireless access point. WPS button – add new wireless devices to your network quickly and easily, without the need to enter your wireless password manually. Reset button – reset your router to factory default settings. 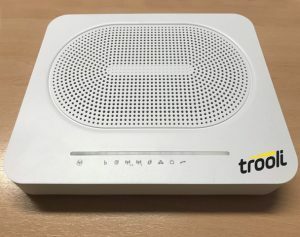 Your Trooli commissioning technician will complete the router set up and the modem set up at the same time as activating your service, and will make sure your connection is working at the expected speed. Your kit includes a white cable with two yellow connectors either end. This is the Ethernet cable. The device that you want to connect to the router – for example a computer, a TV or a gaming console – must have an Ethernet port available. Also check that the router has a yellow Ethernet port available. Your device must be configured to obtain an IP address automatically. This is usually the default setting. If you are unsure, the device manufacturer’s instructions will show you how to connect the device to the internet. Connect one end of the Ethernet cable to one of the yellow Ethernet ports of your router. It is recommended that for your main computer you use the main Ethernet port which is labelled ETH1. Connect the other end of the Ethernet cable to an available ports on your device. Press the power button to turn on the router. Wait at least 10-15 minutes for the router to complete the start-up phase. Once all the lights are on then you are able to start using your Trooli broadband. What do the different LED colours mean?